In addition to carbon dioxide, the increasing concentrations of methane are of great concern. The relative rate of increase of methane has greatly exceeded that of carbon dioxide in the last several decades. Molecule for molecule, this gas is much more powerful as a greenhouse gas than carbon dioxide, although much shorter lived in the atmosphere. Methane now provides for about 20 percent of the greenhouse effect, so the future development of its abundance in the atmosphere is of great interest. The present rate of increase (1 to 1.5 percent per year) is equivalent to adding another 30 to 40 percent of CO2 to the present input, in terms of radiative effect. Methane is partially a result of growing food and ranching (rice, cattle), of producing waste dumps (decay of organic matter) and of deforestation (burning and decay of wood), as well as a by-product of the hydrocarbon economy. None of these sources are anticipated to decrease in the future. On the contrary, with 100 million more people needing food and fuel every year, the expectation must be for increased methane release from human activities. Another source of methane is natural release from a variety of processes, such as decay of wet peat and decay of organic matter in stagnant ponds and warming of the sea floor. For these sources, changes in the environment produced by global warming are important. For example, thawing the permafrost in Alaska and Siberia may considerably influence the methane budget, since previously unavailable organic matter can decay, after thawing, in a wet environment with a lack of free oxygen. This is a prescription for producing methane. We do not know the course global warming will take (it depends on future release of greenhouse gases and all the climate physics associated with that) and we do not know the effect of such warming on the potential methane sources. Hence, all estimates on the future emissions of methane from natural sources are pure guesswork. 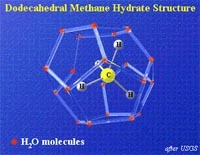 The structure of a methane hydrate molecule. It consists of methane gas (CH4) trapped within an accommodating structure of frozen water (H2O). Source USGS. The biggest unknown � and the one with the greatest potential impact � is the release of methane from a warming sea floor. The amount of methane in the sea floor is thought to be greater than that of all hydrocarbon gases stored in reservoirs on land. In fact, it has been claimed that �methane-laced ice crystals in the seafloor store more energy than all the world's fossil fuel reserves combined� (Erwin Suess, Scientific American, Nov 1999). The icy storage is within a compound called �methane clathrate�, also called �methane hydrate� (See glossary for more on gas hydrates). Methane hydrates form within smelly mud at depths of several hundred meters within water near freezing temperature below high-productivity regions in the oceans. They are unstable when warmed or depressurized and quickly begin to disintegrate when brought up from the seafloor. The importance of methane hydrates only emerged in the last twenty years or so. Their abundance suggests they may be a new untapped source of natural gas. Natural gas is relatively benign in terms of producing pollutants since methane has only consists one carbon atom and four hydrogen atoms, and burning it produces more water than carbon dioxide.